Rebirth of the Matrix homes? 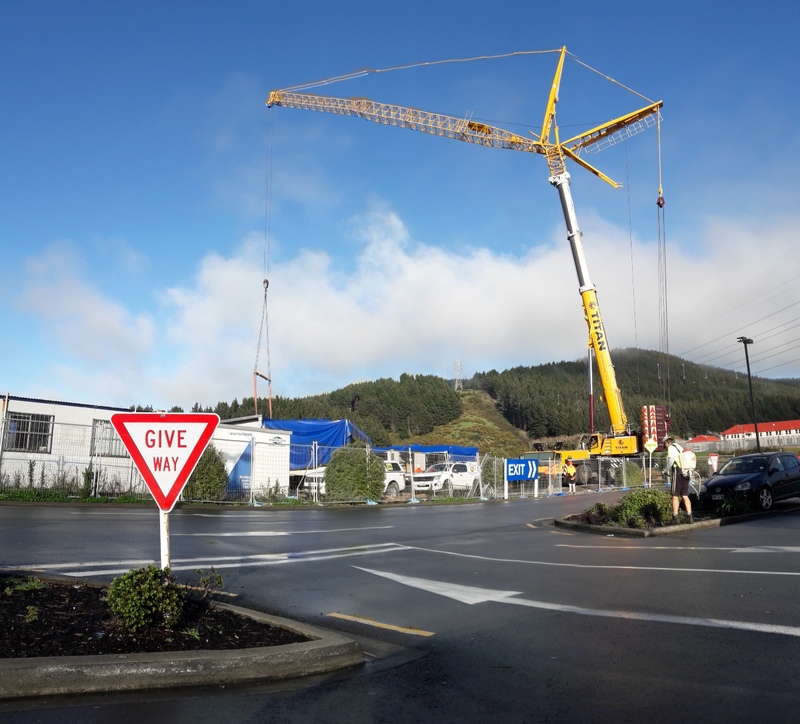 Our fears of the Matrix homes abandoned at Tawa for an extended period of time do not seem to have become true, for a sharp-eyed regular (the one and only mysterious Sea Monkey) sent in these two pics, of a giant mobile crane moving houses around at Tawa yesterday in the balmy weather. It’s the big Daddy of all the Titan cranes so it means that someone is sending some cash out on the site – I’m hoping that some of the houses were perhaps being moved into permanent position, or that perhaps more prefab sections were being moved onto site, but as far as I’m aware, there are still no permanent foundations for the houses to sit on. Anyone with any further info? 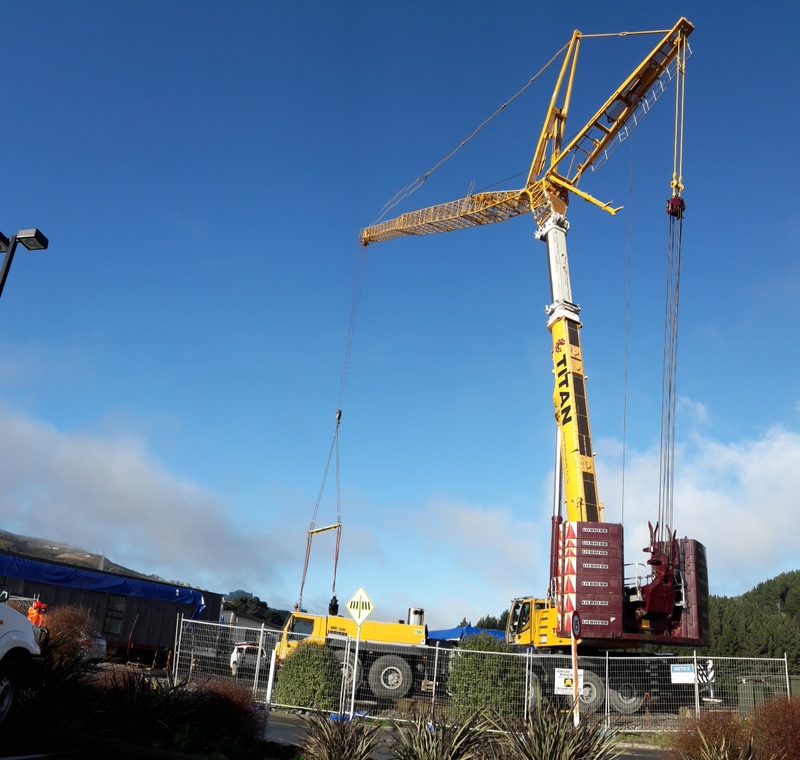 The only reason for a crane of that size is to put top sections on bottom sections, (they can be moved around the site on jackable trailers, – that are a whole lot cheaper to rent than a big boy crane…. I can further report that there are half a dozen houses on foundations now, with scaffolding up around them. “Receivers and liquidators have been unable to fund a buyer for the business of pre-fabrication company Matrix Homes. It was set up by Sean Murrie in 2014 to develop modular houses that were factory built to capture efficiencies that were not available with traditional on-site builds. But lack of sales forced him to place Matrix it in receivership in July 2018 as the main security holder. He told Stuff the biggest problem was the Resource Management Act and local councils. “They want perfect solutions in an imperfect world. They caused so many delays it was impossible to plan ahead,” he said. “It doesn’t matter if it’s modular construction or more traditional building. The same obstacles exist,” Murrie said. He said he was completing 24 Matrix homes in Tawa under a different company. Ironically, in 2015 he had called for compulsory builders’ and developers’ insurance. The main secured creditor at Matrix was Murrie who was owed $2,646,340, with preferential creditors including staff owed approximately $956,721, and unsecured creditors $2,948,308, taking the total amount to more than $6.5 million. Only a small amount was recovered. Although Matrix had secured two significant developments and had been approved as a supplier to Housing New Zealand the existing sales were insufficient to manage the mounting debt to Inland Revenue, and other creditors. Among them was warehouse landlord Camperdown Studios, a company in which film maker Sir Peter Jackson has a significant shareholding. Matrix shared space in the Camperdown warehouse with Weta Workshop and associated companies. Camperdown put Matrix into liquidation while the receivers were still completing their work. Although there were no assets remaining, the liquidation being carried out by John Scuttor was contested by liquidator Damian Grant who called a creditors meeting and argued that he would pursue directors and any other avenue more aggressively. The vote was a stalemate because Grant won the vote by majority value but Scutter won by majority of votes, and as chairman declared the status quo. Grant could challenge the outcome in the High Court but has yet to do so. The receivers had earlier tried to sell the business but were unsuccessful even though they received more than 30 expressions of interest and helped 10 parties conduct due diligence. The assets were sold in an on-site auction. A separate deal to sell the intellectual property, consisting mainly of the multiproof plans, collapsed following due diligence. Employees had preferential claims of $33,403 and were paid 75 per cent of their entitlements. Inland Revenue was owed more than $800,000.